The Soul Nebula (Westerhout 5, Sharpless 2-199, LBN 667) is a large emission nebula located in the constellation Cassiopeia. The apparent size of this deep sky object from Earth makes it a fantastic deep sky astrophotography target to photograph using a DSLR camera and wide field telescope. There are several small open clusters embedded within the Soul Nebula including IC 1848, which the designation this object is often referred to. In November of 2017, I used my DSLR camera and telescope to photograph the Soul Nebula from my backyard in the city. I later added even more exposure time to this project using my DSLR camera and a different refractor telescope. 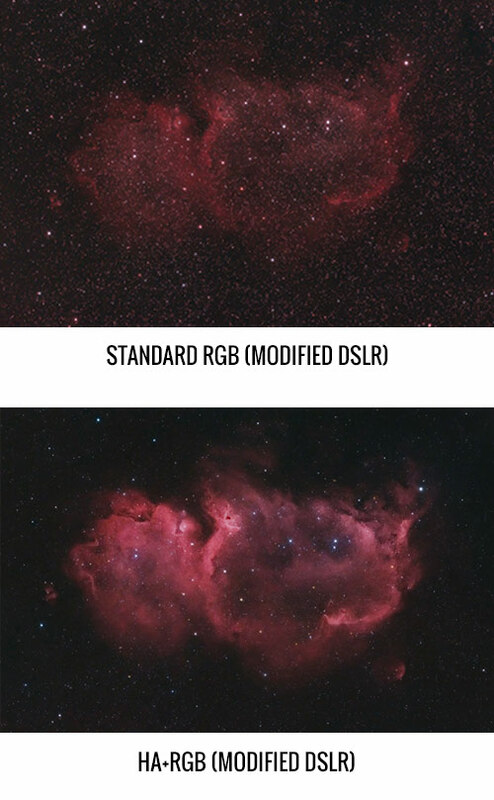 One of my favorite aspects of astrophotography is the ability to improve images over time as need data is acquired. In the fall, this deep sky target rises high into the Northern Hemisphere sky, high above the obstructions in my backyard. For me, this means that it clears the height of my house by about 8pm in October, and 6 pm by November. The telescope is pointed in a Northeast direction, and I am able to track the Soul Nebula on my equatorial GoTo mount for hours before having to perform a manual meridian flip. When it comes to long exposure astrophotography projects, I often choose to photograph objects rising in the East. For the natural color version of the image, I am quite pleased with the amount of detail and overall quality of the data I managed to produce. Under Bortle Class 8 skies, a light pollution filter is needed to help ignore certain wavelengths of artificial light to collect usable data. The SkyTech CLS-CCD filter does a great job at blocking much of the unwanted city glow while preserving the light emitted from my target. This light pollution filter is especially effective when used on emission nebula such as IC 1848. This clip-in style filter was designed to be used with APS-C sized modified Canon EOS DSLR cameras like my Canon Rebel series T3i (600D). 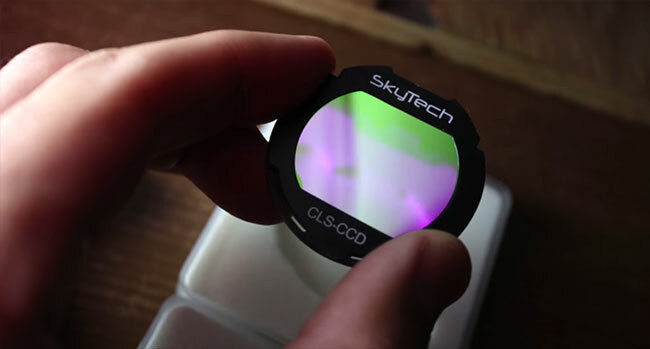 The SkyTech CLS-CCD filter has a wider bandpass than a UHC filter and includes a UV/IR block. My camera has had the full spectrum modification performed, meaning the stock internal IR block was removed. It easily snaps into the body of my DSLR over the camera sensor. The refractor telescope I used to capture my color images of the Soul Nebula has a focal length of 350mm, which is considered to be “ultra-wide field”. This is ideal for photographing large deep-sky objects such as the Soul Nebula, North America Nebula and many more. 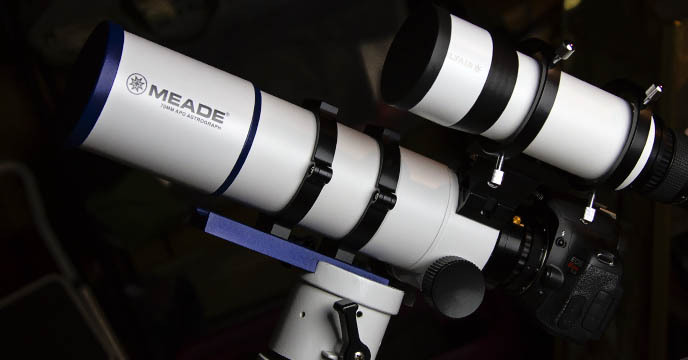 The Meade 70mm Quadruplet ED APO refractor is a high-performance refractor telescope that excels in wide-field deep sky astrophotography. The telescope was mounted to a Sky-Watcher HEQ5 equatorial mount, with an autoguiding system attached. 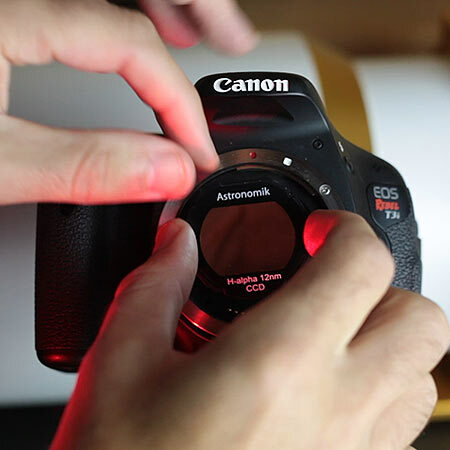 The DSLR attaches to the back of the telescope and can be locked when a precise focus is achieved. The Quadruplet-lens design of the Meade 70mm APO means that I did not require a field flattener when imaging through this scope. 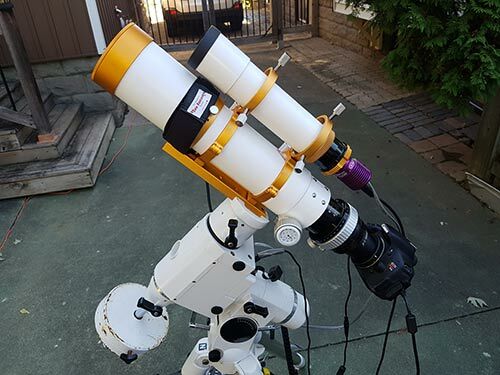 I reviewed this telescope in 2017 if you would like to learn more about its specifications and what you can expect in terms in DSLR astrophotography. I later added additional exposure time using another wide field refractor telescope, the William Optics Zenithstar 73. I again used my full spectrum modified Canon EOS Rebel T3i DSLR, but this time I captured narrowband images in hydrogen-alpha only. The focal length of this refractor is 430mm, which meant I needed to scale the images taken with the 12nm Ha filter in place down to match my color data. This process is quite easy to accomplish using Adobe Photoshop and the free-transform tool. The Soul Nebula is often captured using a camera lens to include the nearby Heart Nebula. To photograph the two objects together, a focal length in the 200mm range is recommended. For this focal length, a camera lens is likely the best option. Most telescopes are not wide enough to capture the Heart and Soul together in the same frame, although the added sensor real estate of a full-frame DSLR may be able to pull it off. 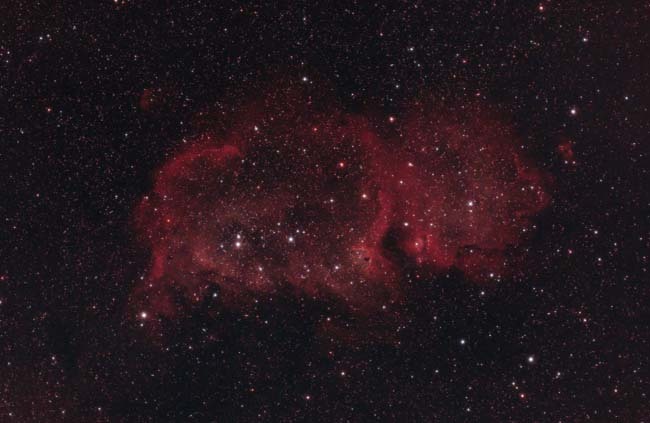 The SkyTech CLS-CCD filter was used captured my color data for the Soul Nebula. This data alone was impressive considering my location but lacked the luminance boost a narrowband filter can provide. The following image includes exactly 5 hours of total integrated exposure time. 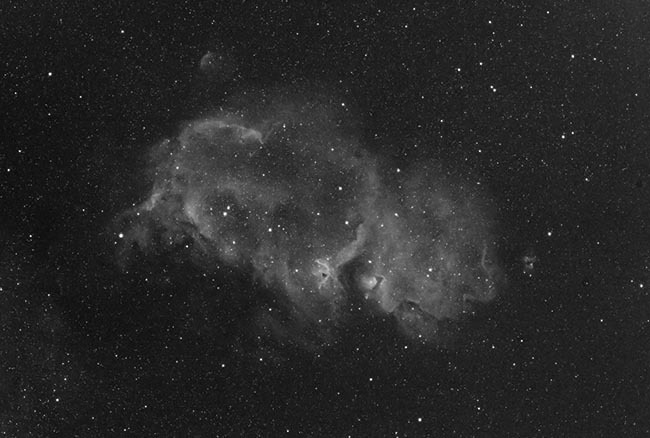 An Astronomik 12nm clip-filter was fitted into my Canon T3i to capture my narrowband h-alpha images of the Soul Nebula. 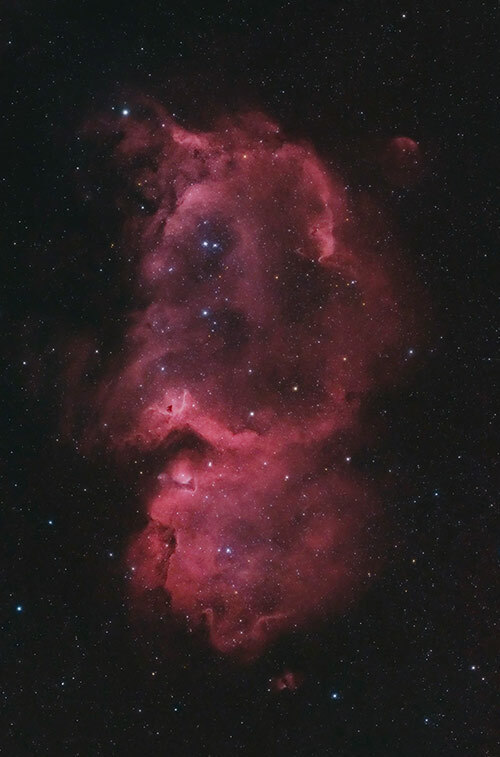 Using a Hydrogen-alpha filter on an emission nebula like this almost completely ignores all artificial light from the city, as well as the bright glow of the moon. The following photo includes 1 hour and 16 minutes of total integrated exposure time. I later added an additional 1.5 hours of hydrogen-alpha data to further improve the signal-to-noise ratio. The images were 5-minutes each in length, using an ISO of 800. The true-color RGB version of the image was combined with the grayscale narrowband version to produce an HaRGB composite. The h-alpha photo was used as a synthetic red channel, as well as a luminance layer. To learn how to combine RGB and Ha images, please watch my HaRGB Photoshop Tutorial. The time for photographing the Soul Nebula (Northern Hemisphere) is in the fall. 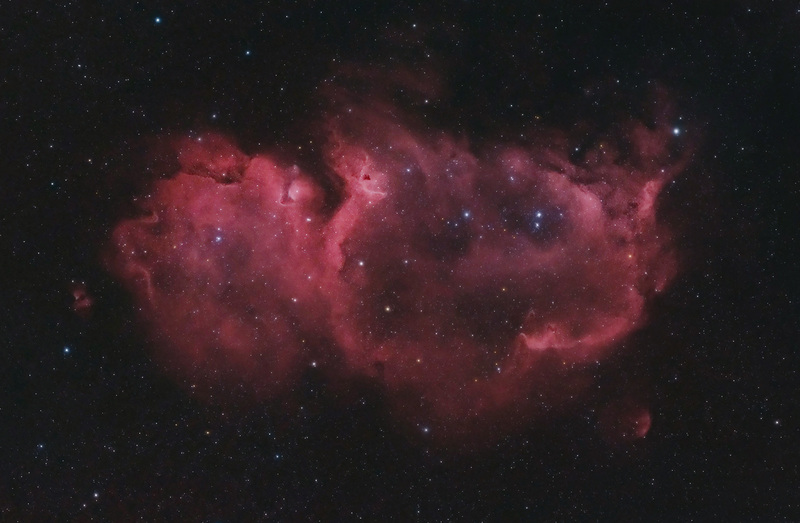 The Heart and Soul Nebula rise high into the sky together from late September through November. 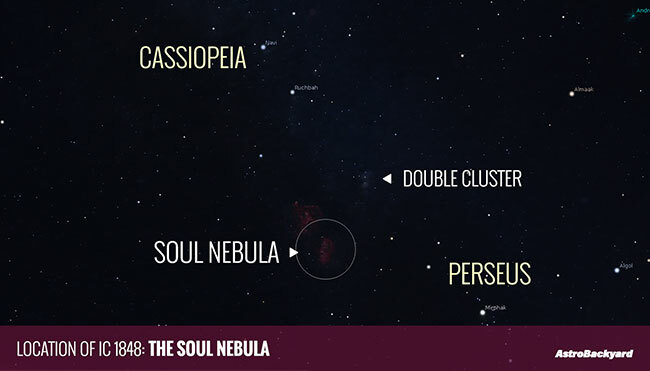 The following star chart shows where to find the Soul Nebula. I find it easiest to first locate the recognizable constellation, Cassiopeia. Then look downwards towards the Double Cluster in Perseus. You’ll find the Soul Nebula to the Northwest of Perseus, between the 2 constellations. If you would like to try processing my color data on this subject, you can do so here. Then, you can follow along with my Photoshop Image Processing Tutorial to get a better idea of how my astrophotography images are produced.